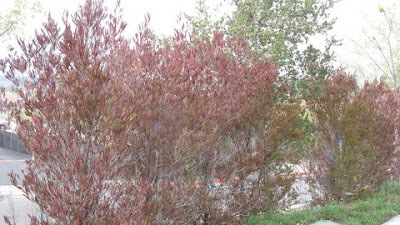 When it comes to finding a low care, low water, versatile evergreen shrub for the sun, you can look no further than the Dodonaea or Hopseed Bush. 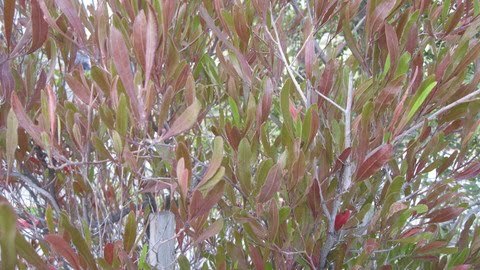 You can find it in both a green variety, and a purple variety, so it will fit in with many color schemes. The plant as a pretty, long tapered leaf, and a light airy form, that makes it a favorite among those looking for an informal look. 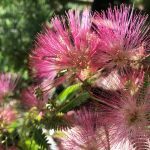 Usually attributed to Australia, it is also found in other places around the globe, primarily in the Mediterranean Climate Zones of which there are five. This explains why they do so well here in Southern California, since we are one of those five. Planting your dodonaea is much like any other shrub, be sure to dig the holes wide – wider than the container you are removing it from but not too deep. Planting a little high is always preferable to planting too deep. If you have heavy clay or sandy soils, amend them with organic material, gently remove your plant from the container, loosen the root ball at the bottom, and place it into the hole, then back fill the holes with that mixture. Water the plant gently and press down to make sure that the plant will not be sinking too low, if it does, remove it and put some additional soil in the bottom of the hole. If you are in a windy area, you can stake your shrubs, so that they will not break. Add a nice 3” – 4” layer of mulch to your planter bed. You want to water your new shrub infrequently but deeply. Having a low water shrub like this on the same water as say turf is a recipe for disaster. As far as watering, you can allow the soil around this plant can dry out 2-3” down between watering. Your dodonaea will not need to be watered more than two or three times per week, even less once it is established – but again make sure that it has long deep watering. If you have a slope and are losing water, cycle your irrigation. The proper way to cycle is water on for a minute off for a while on for another minute and so on. You can just put a hose at the root and let it run very slowly for a long time, set up a proper drip system, or use soaker hoses, whatever you are most comfortable with. Dodonaea need to be properly watered during the winter as well as the summer and can suffer more from drying out than from cold temperatures. If it is windy, there is a sudden long sunny hot spell, or the weather becomes very dry check your plants to make sure that they are not too dry themselves – winter or summer. Mulch helps prevent drying out too, so don’t skip that step! 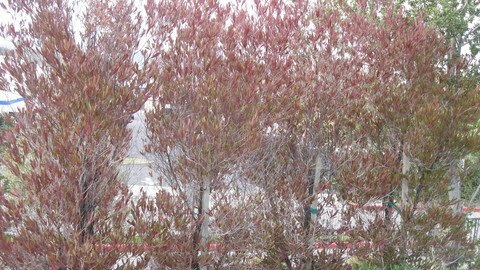 The dodonaea takes well to pruning, it can be hedged, espaliered, or trained into an interesting shape, but it is essential that you prune regularly to maintain size, and for the safety of others. This plant can grow BIG, and if you don’t keep up on it regularly; when you finally do it will look horribly woody. It is good to prune in late winter or spring, best after bloom but since the bloom is inconspicuous and we’re not looking for fruit, I wouldn’t worry too much about whether it’s flowered yet or not. A nice all purpose organic fertilizer is the best bet for the dodonaea, but it is not a heavy feeder. I prefer (slow release) granular fertilizer myself because I think of water soluble as a quick fix for plants that look peeked. I scatter the granular fertilizer under the plant about the width of the widest branches and water deeply (and slowly). That’s pretty much all you need to know for a nice accent, a hedge, or a screen for your property. It also makes a lovely container plant when mixed with some draping plants such as ivy geranium, or scaevola. *** Free design tip!